Dopamine (DA) is a well-known neurotransmitter in the central nervous system (CNS). An increasing body of evidence, however, indicates that DA is also an important communication mediator at the neural-immune interface [1-3]. Most research and studies to date have put the emphasis on DA and it’s regulation of adaptive immunity. Comparatively little is known about the role of DA in innate immunity, an area receiving much less attention despite some clear evidence that dopaminergic mechanisms affect key innate immune cells functions. Here, we provide a brief overview of the current understanding and the recent data in this area. In addition, we also outline some new evidence suggesting a dysfunctional dopaminergic-immune system interface that may contribute to the development and progression of certain immune-mediated pathologies. Dopamine, first identified in 1960 is synthesized from the amino acid tyrosine , in accordance with the pathway shown in Figure 1. In the CNS, DA is produced in different areas, such as substantia nigra, ventral tegmental area (VTA), amygdala, nucleus accumbens and the prefrontal cortex . 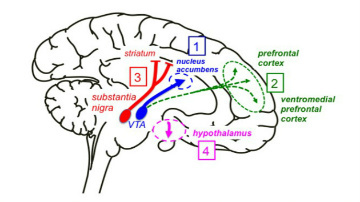 In the mammalian brain there are four major dopaminergic pathways: the nigrostriatal, mesolimbic, mesocortical, and tuberoinfundibolar (see Figure 2). They are involved in the control of several key functions such as behavior, voluntary movement, feeding, attention, affect and motivation, pleasure and reward, drug addiction [6-11]. In the body’s periphery, DA plays important physiological roles in the regulation of the cardiovascular system and vascular tone, hormone secretion and gastrointestinal motility, and kidney functions, including the control of sodium homeostasis and the renin-angiotensin-aldosterone system [12,13]. Interestingly, the mesenteric organs, the gastrointestinal tract, spleen, and pancreas seem to produce close to half of the DA formed in the body . In humans, the range of DA in the plasma is between 5.527 and 527 pmol/L . Another study indicates that the concentration of DA is similar to those of epinephrine (adrenaline), 30 nmol/L. However, DA concentrations can increase in some particular conditions such as stress, or in the niche of a tumor. Dopamine in human tissues can originate not only from endogenous biosynthetic pathways but also from many types of food and plants . The most relevant issue regarding the food-related DA is that it cannot cross the blood brain barrier. Only one study of 1988 conducted in canines, highlighted that the absolute bioavailability of DA after oral administration is approximately 3% . Figure 2. Brain dopaminergic pathways. 1) Mesolimbic and 2) mesocortical pathways control motivation, emotional response, desire, pleasure and reward; involved in the phenomena of addiction; determine delirium and hallucinations when hyperreactive. 3) Nigrostriatal pathway controls mostly the motor function. The degeneration of the cell bodies in this area is implicated in the genesis of Parkinson’s disease. 4) Tubero-infundibular pathway regulates the secretion of prolactin from the anterior pituitary gland. If dopamine cannot be released, then hyperprolactinemia is developed causing abnormal lactation and disruption of the menstrual cycle in women. Abbreviation: VTA, ventral tegmental area. The effect of DA is due to the interaction with two different receptor families that are tightly related, classes of 7-transmembrane, G-protein coupled receptors: D1-like (D1 DR and D5 DR, also known as D1a and D1b) and D2-like (D2 DR, D3 DR and D4 DR). D1-like receptors are located both on pre- and post-synaptic sites, whereas D2-like receptors are post-synaptic . D1-like family receptors activate Gαs/olf proteins to stimulate cyclic adenosine monophosphate (cAMP) production by adenyl cyclase (AC), whereas D2-class receptors stimulate Gαi/o proteins, which inhibit AC, resulting in a drop of the levels of cAMP . Despite DRs in the CNS are well characterized, their role and their characterization at the peripheral level is less known. It is interesting to notice that there are two different isoforms of D2 DR: short (S) and long (L), generated by the alternative splicing of an exon . These two variants of D2 receptor show not only functional differences, but also distinctive distribution in the brain: the D2L is mainly present on the neurons of striatum and nucleus accumbens, whereas the short form is in mesencephalon and hypothalamus . Another important point regarding these receptors is the possibility that these have the form of heteromers with other dopaminergic receptors or with other classes of receptors . The most well-known allosteric interaction between receptors is between the adenosine A2A receptor (A2AR) and DR D2 . This heteromer has multiple and unique biochemical properties, and is responsible for the depressant effects of adenosine analogues and, conversely, for the psychostimulant effects of selective adenosine A2AR antagonists, and the non-selective antagonist (e.g. caffeine). It is also implicated in several neuropsychiatric disorders . For several functions in the brain mediated by DA, there is a concomitant stimulation DR D1 and DR D2 which form a heteromer, not only in pathological conditions, but also under physiological conditions. Regarding other DR heteromer we have only sporadic information; the D1-D3 DR was suggested to have therapeutic implications as a pharmacological target in Parkinson’s disease . D2-D3 DR is considered as a target for antipsychotics  and the D2-D5 DR heteromer, similarly to D1-D2 DR, may have a role in calcium signaling, with the activation of CaMKII, involved in drug addiction and schizophrenia . Dopamine is involved in the CNS-immune system interplay and immune cells themselves produce DA . The effects of DA have been extensively studied on the adaptive immune response and in particular on T lymphocytes. The relevance of dopaminergic modulation of the adaptive immune response in disease conditions has been documented for multiple sclerosis (MS) [29, 30] and rheumatoid arthritis (RA) , and preliminary evidence has been recently provided for Parkinson’s disease (PD) . The role of DA in the modulation of the innate immune response has received little attention and is not very well characterized. Neutrophils are considered the first line of host defense from infectious pathogens, producing reactive oxygen species, neutrophil extracellular traps and cytokines, such as interleukin (IL)-8 . Interestingly, recent data indicate that neutrophils can prolong their lifespan (more than the canonic few hours) to restore the condition of homeostasis . As shown in the study of McKenna , all the five DR are present on the neutrophil surface, with D5 as the highest expressed, whereas D1 the lowest. Different in vitro studies evidenced an inhibitory role of DA on neutrophil functions. It was shown that DA exerts an inhibitory effect on some pivotal neutrophil functions such as superoxide anion production , adhesion molecules expression, cell migration and phagocytic activity [37- 39]. Figure 3a and b. 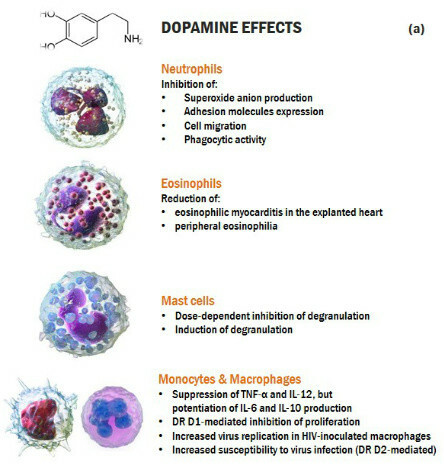 Effects of dopamine on innate immune cells. Moreover, DA is able to modify not only the functional aspects, but also the number of these cells. It was shown that in patients with Parkinson’s disease the count of neutrophils significantly decreased . This is in agreement with what was observed by the group of Sookhai , which demonstrated that DA increases in vitro neutrophil apoptosis both in healthy subjects and in patients with systemic inflammatory response syndrome (see Figure 3). Eosinophils make up about 1–3% of the white blood cells. IL-3, IL-5, and granulocyte macrophage colony stimulating factor (GM-CSF) are key cytokines that control eosinophil development, endothelial adhesion, activation and survival. These cells are considered end-stage cells involved in host protection against multicellular parasites. Along with mast cells and basophils, they also control mechanisms associated with allergy and asthma . Eosinophils express on their surface all five DRs  but only few data are available about the effect of DA. The most relevant concept suggests that DA might be used as additional medication is that the administration of DA in patients awaiting heart transplant resulted in a reduction of the peripheral eosinophilia, and the eosinophilic myocarditis in the explanted heart . No data are available about the presence of DR on basophils, as well as about a possible role of DA as modulator of basophils’ functions. Mast cells were first described in 1878 by Paul Erlich. These cells have very a long lifespan and represent a multifunctional immune cell subtype characterized by the presence of large granules. They are found in most tissues of the body, with a particular high density in the airways. The primary role of these cells is to react to allergens. Mast cells circulate in the bloodstream in an immature form before the differentiation in the tissues. After the recognition of a pathogen, the activation of these cells causes the release of several granules containing histamine, tumor necrosis factor (TNF)-α and IL-4 through which they can modulate the immune response. Mast cells, mainly present in the airways, contain DA and express the rate-limiting enzyme tyrosine hydroxylase (TH), necessary for the biosynthesis of DA . Several dopaminergic agents showed a dose-dependent inhibition of mast cell degranulation, but this effect seemed not to be related with DR . This, however, is in contrast to the data of Mori and colleagues, showing that treatment with DA induces mast cell degranulation, and that the use of a D1-like antagonist prevented this effect . Monocytes and macrophages, together with dendritic cells, constitute the mononuclear phagocyte system which plays a key role maintaining tissue integrity during development and its restoration after injury. Monocytes after developing from myeloid precursors in the bone marrow enter the blood circulation, where they circulate for a few days and then migrate into tissues to complete their maturation into tissue macrophages. Under specific stimuli coming from different chemokines and cytokines, they are rapidly recruited into damaged tissues. Other functions ascribed to these cells are the control of development, homeostasis, and tissue repair . Due to their heterogeneity, monocytes are divided into subsets based on the different stages of differentiation, size and activation. Macrophages are able to embody microorganisms and damaged tissues. They originate from monocytes, which leave the bloodstream, as mentioned above, and undergo morpho-functional changes in response to several differentiation factors such as granulocyte-macrophage colony-stimulating factor (GM-CSF) . Several studies indicate that human monocytes and macrophages express DRs both at mRNA and protein levels, express all five subtypes of dopamine receptors, and are able to produce DA [35,49]. In monocyte-derived macrophages treated with LPS, DA decreases TNF-α production, but up-regulates IL-6 and IL-10 production . Also, DA can decrease LPS-induced proliferation of human monocytes and, acting on DR D1, prevent systemic and neuro-inflammation in vivo . In mouse macrophages, DA suppresses the production of IL-12, a major Th1-related and pro-inflammatory cytokine, but potentiates the secretion of IL-10, a key anti-inflammatory and immunosuppressive cytokine . The above-mentioned effects may explain, to some extent, the evidence that in macrophages inoculated with HIV virus, the treatment with DA leads to an increase of virus replication. Similarly, macrophages of cerebral areas rich of DA are more susceptible to virus infection, and these effects seems to involve D2-like receptors . Microglia were originally described in 1932 by Pío del Rio-Hortega, these cells show a unique phenotype different from both glia and neurons . Microglia are divided into subpopulations according to anatomical location: perivascular microglia, mainly within the basal lamina of a blood vessel and juxtavascular microglia, externally in contact with the basal lamina of the blood vessel . An unregulated activation of microglia in response to environmental stimuli may propagate neuronal injury and be responsible for the neurodegeneration that occurs in several pathologies like Alzheimer’s and Parkinson’s diseases, as well as multiple sclerosis . The five DR are expressed in cultured murine and rat glial cells . Yet human microglia all express DR with the exception of DR D1. The data about the dopaminergic regulation of microglia has been recently revised in detail by Gaskill and colleagues . Dendritic cells (DC) are antigen-presenting cells, which possess high phagocytic activity as immature cells, and high cytokine producing ability, as mature cells. Their pivotal function is to present the antigens to the T cells. DCs express DRs and are able to produce and store DA [59, 60]. In human monocyte-derived dendritic cells, DA dose dependently increases cAMP levels via D1-like receptors and shifts the T-cell differentiation towards the Th2 phenotype. Thus, DA functions as a Th2-polarizing factor at the DC-naive T-cell interface . In addition, the production of IL-12, an important marker of DC maturation, is also modified by the treatment with haloperidol, a D2-like DR antagonist, which attenuate its production and consequently reduce cells maturation . Natural Killer (NK) cells are a subpopulation of lymphocyte-related cells that recognize and kill infected and/or damaged cells by secreting inflammatory cytokines such as GM-CSF, TNF-α, interferon (IFN)-γ, and chemokines such as macrophage inflammatory protein (MIP)-1, CC chemokine ligand (CCL)3, CCL4 and CCL5 . NK express on their surface DRs . The use of D1-like DR agonist enhanced NK cytotoxicity, while the D2-like DR agonist showed opposite effects . In human peripheral-blood derived NK, drugs acting as dopaminergic antagonists may inhibit NK cell responses. 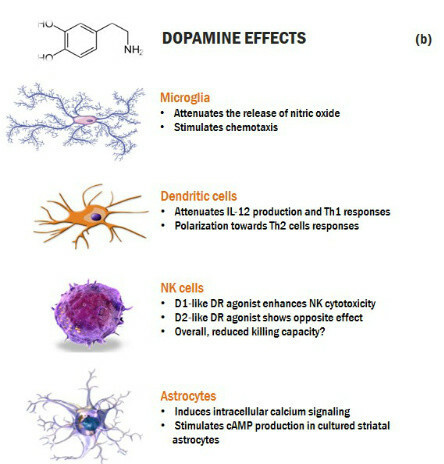 Thus, the different activation of the dopaminergic system can influence the killing capacity of NK. In fact, spleen-derived NK of rats with a hyperactive dopaminergic system had a reduced killing capacity compared to those of hypo-dopaminergic rats . Astrocytes are the most abundant non-excitable cells of the brain. They are divided into two principal subtypes: protoplasmic, mostly found in the grey matter, and fibrous, in the white matter . The most important functions of these cells include the regulation of blood flow, their close interaction with blood vessels and their role played in the formation and elimination of synapses. They have a role not only in physiological, but also in pathological conditions such as Rett syndrome, fragile X mental retardation, Alexander’s disease and maybe in Down syndrome . Astrocytes can be influenced by DA by inducing the intracellular calcium signaling  and stimulating cAMP production in cultured rat striatal astrocytes . Different studies demonstrate the role of peripheral immunity in neurodegenerative and immune-mediated diseases, like multiple sclerosis (MS)  rheumatoid arthritis (RA)  and HIV . Multiple sclerosis is a demyelinating neurodegenerative disease with lesions in the central nervous system. In this pathology, damage and loss of myelin occurs in multiple areas. The process of demyelination determines the formation of plaques that can evolve from an initial inflammatory phase to a chronic phase, in which they assume characteristics similar to scars. The substantial involvement of dopaminergic pathways in MS is clearly demonstrated in different studies  that highlight the key role of DRs D5, which increase their expression in the course of the disease . However, most of the evidence relates to acquired immunity, little is known about the involvement of innate immunity. It is known that in MS monocytes and DC exert a key role in antigen presentation, leading to promotion of inflammation and tissue damage, contributing to the breakdown of the blood-brain barrier and facilitating the trafficking of T cells within the CNS [71, 72]. Mast cells, as well as neutrophils, also participate in the progression of disease, for example, exacerbating the inflammatory status in the early development of EAE in rodent model . Rheumatoid arthritis (RA) is a chronic, systemic and disabling inflammatory disease with most likely autoimmune origin. In RA, innate immunity plays a pivotal role. Macrophages infiltrating the synovial fluid show an inflammatory phenotype releasing pro-inflammatory cytokines such as IL-1β . Neutrophils, DCs and NK cells also participate in the development of the pathology, releasing inflammatory mediators [75-77]. Regarding the involvement of the dopaminergic system in RA, it has been shown that DRs increase their expression in synovial fibroblasts . Moreover, in rats, treatment with haloperidol, a D2-like DR antagonist, reduced immunological, pro-inflammatory and oxidative stress biomarkers, in the complete Freund’s adjuvant-induced arthritis model . To date, no studies are available evaluating the relationship between dopaminergic pathways and innate immune cells in the specific context of RA. Amyotrophic lateral sclerosis (ALS) is a degenerative disease that affects the brain cells responsible for controlling the muscles, progressively compromising the movements of the voluntary musculature. Several lines of evidence suggest a potential involvement of innate immunity in the pathogenesis of ALS. In the mouse model, Zondler and colleagues emphasize the importance of peripheral monocytes in the ALS pathogenesis and point out on the protective role of monocytes in the early phase of the disease . In 1998, the group of Borasio  demonstrated a deficit in the nigrostriatal pathway using single-photon emission computed tomography. Also, in vivo studies evidenced a decreased DRs D2 binding in the striatum of ALS patients . The involvement of DRs D2 in this pathology was confirmed by a recent study, where the use of bromocriptine, a DRs D2 agonist, slows the progression of ALS . Nevertheless, the involvement and/or the dysregulation of immune cells DR pathways in ALS remains poorly understood. Alzheimer’s disease (AD), a progressive neurodegenerative disease, represents the most common form of dementia with a progressive loss of cognitive functions. The role of the dopaminergic system in AD is still debated, even if the degeneration of dopaminergic neurons is linked with a deterioration of cognitive tasks . Alzheimer’s disease also displays alterations of striatal D2 receptors that may be part of the pathologic abnormalities and may participate in the extrapyramidal manifestations that occur in this condition . Several studies indicate the possible involvement of innate immunity in AD. Neutrophils were observed by in vivo imaging techniques in the amyloid plaques where they infiltrated and contributed to the inflammatory status by secretion of pro-inflammatory cytokines . Neutrophil depletion reduces the severity of AD progression . In addition, the monocytes in AD patients possess the pro-inflammatory phenotype . HIV is a virus that attacks the cells of immune system, primarily CD4+ T cells and macrophages. Based on current knowledge, HIV is divided into two strains: HIV-1 and HIV-2. HIV-1 is the most virulent, most infectious and the cause of most HIV infections worldwide. It is mainly located in Europe, America and Central Africa. HIV-2, on the other hand, is found mostly in West Africa and Asia and causes a clinically more moderate syndrome compared to the previous strain. The primary targets of HIV are macrophages, as suggested by the presence of the virus in the conventional sites of macrophages, like meninges and the perivascular areas . DA has a very strong impact on the function of macrophages and was observed that the elevated level of DA in drug abusers correlated with an increased entry of the virus in macrophages . This massive entry is linked to the activation of DR on macrophages. In fact, the use of a pan antagonist for DR eliminates this effect . In addition, DC and NK cells play an antiviral effect . Septic shock is a systemic syndrome due to a serious infection with sepsis. It involves the entire organism, even if the infectious agent is only presented at a particular body site. DA, together with others inotropes, is the first vasopressor used that increased blood pressure and flow and vasodilatation . During sepsis, DA exerts an immune-suppressive effect against neutrophils and macrophages, inhibiting cytokine secretion . In conclusion, we highlighted recent evidence that DA influences key functions of innate immune cells, acting differently depending on the interaction with D1- or D2-like receptors. This includes the production of cytokines, chemotaxis and the expression of surface markers, and the polarization towards Th2 cells responses. Of note, it is known that in pathologies such as multiple sclerosis the expression of DRs on the cells of acquired immunity correlate with disease activity and development, and is modified by the correspondent treatment. It could therefore be useful to analyze, upstream, the influence exerted by DA on the cells of innate immunity, as they are able to modify the activity of acquired immunity. 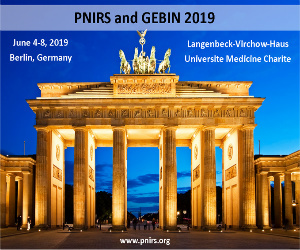 This approach may justify further studies and suggests new therapeutic strategies in counteracting the cell activation and tissues invasion, known to be the first step in the majority of immune-mediated diseases, including inflammatory diseases of the CNS. Monica Pinoli – Center of Research in Medical Pharmacology, University of Insubria, Via Ottorino Rossi n. 9, 21100 Varese, VA, Italy. The contents of this article were adapted from Pinoli M, Marino F, Cosentino M. Dopaminergic Regulation of Innate Immunity: a Review. J Neuroimmune Pharmacol. (2017). doi: 10.1007/s11481-017-9749-2. Basu S, Dasgupta PS (2000). Dopamine, a neurotransmitter, influences the immune system. J Neuroimmunol 102(2):113-24. Sarkar C, Basu B, Chakroborty D, Dasgupta PS, Basu S (2010). The immunoregulatory role of dopamine: an update. Brain Behav Immun 24(4):525-8. doi: 10.1016/j.bbi.2009.10.015. Carlsson A, Falck B, Hillarp NA (1962). Cellular localization of brain monoamines. Acta Physiol Scand Suppl. 56:1–28. Feldman RS, Meyer JS, Quenzer LF (1997). Catecholamines in: Principles of neuropsychopharmacology, Sunderland, Massachusets, USA: Sinauer Associates Inc., pp 277–344. Cenci MA (2007). Dopamine dysregulation of movement control in L-DOPA induced dyskinesia. Trends Neurosci 30(5):236-43. Sarkar C, Chakroborty D, Basu S (2013). Neurotransmitters as regulators of tumor angiogenesis and immunity: the role of catecholamines. J Neuroimmune Pharmacol 8(1):7-14. doi: 10.1007/s11481-012-9395-7. Missale C, Nash SR, Robinson SW, Jaber M, Caron MG (1998). Dopamine receptors: from structure to function. Physiol Rev 78(1):189-225. Zhang MZ, Yao B, Wang S, Fan X, Wu G, Yang H, Yin H, Yang S, Harris RC (2011). Intrarenal dopamine deficiency leads to hypertension and decreased longevity in mice. J Clin Invest. 121(7):2845-54. doi: 10.1172/JCI57324. Eisenhofer G, Aneman A, Friberg P, Hooper D, Fåndriks L, Lonroth H, Hunyady B, Mezey E (1997) Substantial production of dopamine in the human gastrointestinal tract. J Clin Endocrinol Metab 82:3864-3871. doi:10.1210/jcem.82.11.4339. Eichler I, Eichler HG, Rotter M, Kyrle PA, Gasic S, Korn A (1989) Plasma concentrations of free and sulfoconjugated dopamine, epinephrine, and norepinephrine in healthy infants and children. Klin Wochenschr 67:672–675. Kulma A, Szopa J (2007). Catecholamines are active compounds in plants. Plant Sci 172(3):433-440. Murata K, Noda K, Kohno K, Samejima M (1988) Bioavailability and pharmacokinetics of oral dopamine in dogs. J Pharm Sci 77:565–568. Sibley DR, Monsma FJ Jr, Shen Y (1993). Molecular neurobiology of dopaminergic receptors. Int Rev Neurobiol. 35:391-415. Beaulieu JM, Gainetdinov RR (2011). The physiology, signaling, and pharmacology of dopamine receptors. Pharmacol Rev. 63(1):182-217. doi: 10.1124/pr.110.002642. Beaulieu JM, Espinoza S, Gainetdinov RR (2015). Dopamine receptors – IUPHAR Review 13. Br J Pharmacol. 172(1):1-23. Kahn ZU, Mrzljak L, Gutierrez A, de la Calle A, Goldman-Rakic PS (1998). Prominence of the dopamine D2 short isoform in dopaminergic pathways. Proc Natl Acad Sci U S A. 95(13):7731-6. Perreault ML, Hasbi A, O’Dowd BF, George SR (2014). Heteromeric Dopamine Receptor Signaling Complexes: Emerging Neurobiology and Disease Relevance. Neuropsychopharmacology. 39(1):156-68. doi: 10.1038/npp.2013.148. Casadó-Anguera V, Bonaventura J, Moreno E, Navarro G, Cortés A, Ferré S, Casadó V (2016). Evidence for the heterotetrameric structure of the adenosine A2A-dopamine D2 receptor complex. Biochem Soc Trans. 44(2):595-600. doi: 10.1042/BST20150276. Ferrè S, Bonaventura J, Tomasi D, Navarro G, Moreno E, Cortés A, Lluís C, Casadó V, Volkow ND (2016). Allosteric mechanisms within the adenosine A2A-dopamine D2 receptor heterotetramer. Neuropharmacology. 104:154-60. doi: 10.1016/j.neuropharm.2015.05.028. Ferrè S, Lluı´s C, Lanciego JL, Franco R (2010). Prime time for G-protein-coupledvreceptor heteromers as therapeutic targets for CNS disorders: the dopamine D(1)-D(3) receptor heteromer. CNS Neurol Disord Drug Targets 9: 596–600. Maggio R, Millan MJ (2010). Dopamine D2-D3 receptor heteromers: pharmacological properties and therapeutic significance. Curr Opin Pharmacol 10: 100–107. So CH, Verma V, Alijaniaram M, Cheng R, Rashid AJ, O’Dowd BF et al. (2009). Calcium signaling by dopamine D5 receptor and D5-D2 receptor hetero-oligomers occurs by a mechanism distinct from that for dopamine D1-D2 receptor hetero-oligomers. Mol Pharmacol 75: 843–854. Bergquist J, Silberring J (1998). Identification of catecholamines in the immune system by electrospray ionization mass spectrometry. Rapid Commun Mass Spectrom. 12(11):683-8. Zaffaroni M, Marino F, Bombelli R, Rasini E, Monti M, Ferrari M, Ghezzi A, Comi G, Lecchini S, Cosentino M (2008). Therapy with interferon-beta modulates endogenous catecholamines in lymphocytes of patients with multiple sclerosis. Exp Neurol. 214(2):315-21. doi: 10.1016/j.expneurol.2008.08.015. Cosentino M, Marino F (2013) Adrenergic and dopaminergic modulation of immunity in multiple sclerosis: teaching old drugs new tricks? J NeuroImmune Pharmacol 8:163–179. doi:10.1007/s11481-012-9410-z. Capellino S, Cosentino M, Wolff C, Schmidt M, Grifka J, Straub RH (2010). Catecholamine-producing cells in the synovial tissue during arthritis: modulation of sympathetic neurotransmitters as new therapeutic target. Ann Rheum Dis. 69(10):1853-60. doi: 10.1136/ard.2009.119701. González H, Contreras F, Prado C, Elgueta D, Franz D, Bernales S, Pacheco R (2013) Dopamine receptor D3 expressed on CD4+ T cells favors neurodegeneration of dopaminergic neurons during Parkinson’s disease. J Immunol 190:5048–5056. doi:10.4049/jimmunol.1203121. Pinoli M, Schembri L, Scanzano A, Legnaro M, Rasini E, Luini A, de Eguileor M, Pulze L, Marino F, Cosentino M (2016). Production of proinflammatory mediators by human neutrophils during long-term culture. Int J Clin Exp Pathol 9(2):1858-1866. Kolaczkowska E, Kubes P (2013). Neutrophil recruitment and function in health and inflammation. Nat Rev Immunol 13(3):159-75. doi: 10.1038/nri3399. McKenna F, McLaughlin PJ, Lewis BJ, Sibbring GC, Cummerson JA, Bowen-Jones D, Moots RJ (2002). Dopamine receptor expression on human T- and B-lymphocytes, monocytes, neutrophils, eosinophils and NK cells: a flow cytometric study. J Neuroimmunol 132(1-2):34-40. Yamazaki M, Matsuoka T, Yasui K, Komiyama A, Akabane T (1989). Dopamine inhibition of superoxide anion production by polymorphonuclear leukocytes. J Allergy Clin Immunol 83(5):967-72. Wenisch C, Parschalk B, Weiss A, Zedwitz-Liebenstein K, Hahsler B, Wenisch H, Georgopoulos A, Graninger W (1996). High-dose catecholamine treatment decreases polymorphonuclear leukocyte phagocytic capacity and reactive oxygen production. Clin Diagn Lab Immunol 3(4):423-8. Sookhai S, Wang JH, Winter D, Power C, Kirwan W, Redmond HP (2000). Dopamine attenuates the chemoattractant effect of interleukin-8: a novel role in the systemic inflammatory response syndrome. Shock 14(3):295-9. Cordano C, Pardini M, Cellerino M, Schenone A, Marino F, Cosentino M (2015). Levodopa-induced neutropenia. Parkinsonism Relat Disord. 21(4):423-5. doi: 10.1016/j.parkreldis.2015.02.002. Sookhai S, Wang JH, McCourt M, O’Connell D, Redmond HP (1999). Dopamine induces neutrophil apoptosis through a dopamine D-1 receptor-independent mechanism. Surgery 126(2):314-22. Rothenberg ME, Hogan SP (2006). The eosinophil. Annu Rev Immunol 24:147-74. Takkenberg JJ, Czer LS, Fishbein MC, Luthringer DJ, Quartel AW, Mirocha J, Queral CA, Blanche C, Trento A (2004). Eosinophilic myocarditis in patients awaiting heart transplantation. Crit Care Med 32(3):714-21. Rönnberg E, Calounova G, Pejler G (2012). Mast cells express tyrosine hydroxylase and store dopamine in a serglycin-dependent manner. Biol Chem 393(1-2):107-12. Seol IW, Kuo NY, Kim KM (2004). Effects of Dopaminergic Drugs on the Mast Cell Degranulation and Nitric Oxide Generation in RAW 264.7 Cells. Arch Pharm Res 27(1): 94-98. Mori T, Kabashima K, Fukamachi S, Kuroda E, Sakabe J, Kobayashi M, Nakajima S, Nakano K, Tanaka Y, Matsushita S, Nakamura M, Tokura Y (2013). D1-like dopamine receptors antagonist inhibits cutaneous immune reactions mediated by Th2 and mast cells. J Dermatol Sci 71(1):37-44. doi: 10.1016/j.jdermsci.2013.03.008. De Kleer I, Willems F, Lambrecht B, Goriely S (2014). Ontogeny of myeloid cells. Front Immunol 5:423. doi: 10.3389/fimmu.2014.00423. Parihar A, Eubank TD, Doseff AI (2010). Monocytes and macrophages regulate immunity through dynamic networks of survival and cell death. J Innate Immun 2(3):204-15. doi: 10.1159/000296507. Gaskill PJ, Carvallo L, Eugenin EA, Berman JW (2012). Characterization and function of the human macrophage dopaminergic system: implications for CNS disease and drug abuse. J Neuroinflammation 2012, 18;9:203. doi: 10.1186/1742-2094-9-203. Yan Y, Jiang W, Liu L, Wang X, Ding C, Tian Z, Zhou R (2015) Dopamine controls systemic inflammation through inhibition of NLRP3 inflammasome. Cell 160:62–73. doi:10.1016/j.cell.2014.11.047. Haskó G, Szabó C, Németh ZH, Deitch EA (2002). Dopamine suppresses IL-12 p40 production by lipopolysaccharide-stimulated macrophages via a beta-adrenoceptor-mediated mechanism. J Neuroimmunol 122(1-2):34-9. Gaskill PJ, Calderon TM, Luers AJ, Eugenin EA, Javitch JA, Berman JW (2009). Human immunodeficiency virus (HIV) infection of human macrophages is increased by dopamine: a bridge between HIV-associated neurologic disorders and drug abuse. Am J Pathol 175(3):1148-59. doi: 10.2353/ajpath.2009.081067. Kettenmann H, Hanisch UK, Noda M, Verkhratsky A (2011). Physiology of microglia. Physiol Rev. 91(2):461-553. doi: 10.1152/physrev.00011.2010. Gehrmann J, Matsumoto Y, Kreutzberg GW (1995). Microglia: intrinsic immuneffector cell of the brain. Brain Res Brain Res Rev. 20(3):269-87. Block ML, Hong JS (2005). Microglia and inflammation-mediated neurodegeneration: Multiple triggers with a common mechanism. Prog Neurobiol. 76(2):77-98. Huck JH, Freyer D, Böttcher C, Mladinov M, Muselmann-Genschow C, Thielke M, Gladow N, Bloomquist D, Mergenthaler P, Priller J (2015). De novo expression of dopamine D2 receptors on microglia after stroke. J Cereb Blood Flow Metab. 35(11):1804-11. doi: 10.1038/jcbfm.2015.128. Mastroeni D, Grover A, Leonard B, Joyce JN, Coleman PD, Kozik B, Bellinger DL, Rogers J (2009). Microglial responses to dopamine in a cell culture model of Parkinson’s disease. Neurobiol Aging. 30(11):1805-17. doi: 10.1016/j.neurobiolaging.2008.01.001. Gaskill PJ, Calderon TM, Coley JS, Berman JW (2013). Drug induced increases in CNS dopamine alter monocyte, macrophage and T cell functions: implications for HAND. J Neuroimmune Pharmacol. 8(3):621-42. doi: 10.1007/s11481-013-9443-y. Nakano K, Higashi T, Hashimoto K, Takagi R, Tanaka Y, Matsushita S (2008). Antagonizing dopamine D1-like receptor inhibits Th17 cell differentiation: Preventive and therapeutic effects on experimental autoimmune encephalomyelitis. Biochem biophys Res Commun 373: 286-291. doi: 10.1016/j.bbrc.2008.06.012. Nakano K, Higashi T, Takagi R, Hashimoto K, Tanaka Y, Matsushita S (2009). Dopamine released by dendritic cells polarizes Th2 differentiation. Int Immunol 21(6):645-654. doi: 10.1093/intimm/dxp033. Matsumoto A, Ohta N, Goto Y, Kashiwa Y, Yamamoto S, Fujino Y (2015). Haloperidol Suppresses Murine Dendritic Cell Maturation and Priming of the T Helper 1–Type Immune Response. Anesth Analg 120(4):895-902. doi: 10.1213/ANE.0000000000000606. Walzer T, Dalod M, Robbins SH, Zitvogel L, Vivier E (2005). Natural-killer cells and dendritic cells : “l’union fait la force”. Blood 106(7):2252-8. Zhao W, Huang Y, Liu Z, Cao BB, Peng YP, Qiu YH (2013). Dopamine Receptors Modulate Cytotoxicity of Natural Killer Cells via cAMP-PKA-CREB Signaling Pathway. PLoS One 2013, 8(6):e65860. doi: 10.1371/journal.pone.0065860. Sofroniew M, Vinters HV (2010). Astrocytes: biology and pathology. Acta Neuropathol. 119(1):7-35. doi: 10.1007/s00401-009-0619-8. Molofsky AV, Krencik R, Ullian EM, Tsai HH, Deneen B, Richardson WD, Barres BA, Rowitch DH (2012). Astrocytes and disease: a neurodevelopmental perspective. Genes Dev. 26(9):891-907. doi: 10.1101/gad.188326.112. Vaarmann A, Ghandi S, Abramov AY (2010). Dopamine Induces Ca2+ Signaling in Astrocytes through Reactive Oxygen Species Generated by Monoamine Oxidase. J Biol Chem. 2010 285(32):25018-23. doi: 10.1074/jbc.M110.111450. Zanassi P, Paolillo M, Montecucco A, Avvedimento EV, Schinelli S (1999). Pharmacological and molecular evidence for dopamine D(1) receptor expression by striatal astrocytes in culture. J Neurosci Res. 58(4):544-52. Marino F, Cosentino M (2016). Multiple sclerosis: Repurposing dopaminergic drugs for MS–the evidence mounts. Nat Rev Neurol. 12(4):191-2. doi: 10.1038/nrneurol.2016.33. Pacheco R, Contreras F, Zouali M (2014). The dopaminergic system in autoimmune diseases. Front Immunol. 5:117. doi: 10.3389/fimmu.2014.00117. Prado C, Contreras F, Gonzalez H, Diaz P, Elgueta D, Barrientos M, Herrada AA, Lladser A, Bernales S, Pacheco R (2012). Stimulation of Dopamine Receptor D5 Expressed on Dendritic Cells Potentiates Th17-mediated immunity. The Journal of Immunology 188:3062-3070. doi: 10.4049/jimmunol.1103096. Waschbisch A, Manzel A, Linker RA, Lee DH (2011) Vascular pathology in multiple sclerosis: mind boosting or myth busting? Exp Transl Stroke Med. doi:10.1186/2040-7378-3-7. Hertwig L, Pache F, Romero-Suarez S, Stürner KH, Borisow N, Behrens J, Bellmann-Strobl J, Seeger B, Asselborn N, Ruprecht K, Millward JM, Infante-Duarte C, Paul F (2016). Distinct functionality of neutrophils in multiple sclerosis and neuromyelitis optica. Mult Scler. 2016 Feb;22(2):160-73. doi: 10.1177/1352458515586084. Gierut A, Perlman H, Pope RM (2010). Innate Immunity and Rheumatoid Arthritis. Rheum Dis Clin North Am. 36(2):271-96. doi: 10.1016/j.rdc.2010.03.004. Wright HL, Moots RJ, Edwards SW (2014). The multifactorial role of neutrophils in rheumatoid arthritis. Nat Rev Rheumatol. 10(10):593-601. doi: 10.1038/nrrheum.2014.80. Lutzky V, Hannawi S, Thomas R (2007). Cells of the synovium in rheumatoid arthritis. Dendritic cells. Arthritis Res Ther. 9(4):219. Falgarone G, Jaen O, Boissier MC (2005). Role for Innate Immunity in Rheumatoid Arthritis. Joint Bone Spine. 72(1):17-25. Capellino S, Cosentino M, Luini A, Bombelli R, Lowin T, Cutolo M, Marino F, Straub RH (2014). Increased Expression of Dopamine Receptors in Synovial Fibroblasts From Patients With Rheumatoid Arthritis. Arthritis Rheumatol. 66(10):2685-93. doi: 10.1002/art.38746. Fahmy Wahba MG, Shehata Messiha BA, Abo-Saif AA (2015). Ramipril and haloperidol as promising approaches in managing rheumatoid arthritis in rats. Eur J Pharmacol. 765:307-15. doi: 10.1016/j.ejphar.2015.08.026. Zondler L, Müller K, Khalaji S, Bliederhäuser C, Ruf WP, Grozdanov V, Thiemann M, Fundel-Clemes K, Freischmidt A, Holzmann K, Strobel B, Weydt P, Witting A, Thal DR, Helferich AM, Hengerer B, Gottschalk KE, Hill O, Kluge M, Ludolph AC, Danzer KM, Weishaupt JH (2016) Peripheral monocytes are functionally altered and invade the CNS in ALS patients. Acta Neuropathol 132:391-411. doi:10.1007/s00401-016-1548-y. Borasio GD, Linke R, Schwarz J, Schlamp V, Abel A, Mozley PD, Tatsch K (1998) Dopaminergic deficit in amyotrophic lateral sclerosis assessed with [I-123] IPT single photon emission computed tomography. J Neurol Neurosurg Psychiatry 65:263–265. Vogel DY, Vereyken EJ, Glim JE, Heijnen PD, Moeton M, van der Valk P, Amor S, Teunissen CE, van Horssen J, Dijkstra CD (2013). Macrophages in inflammatory multiple sclerosis lesions have an intermediate activation status. J Neuroinflammation. 10:35. doi: 10.1186/1742-2094-10-35. Nagata E, Ogino M, Iwamoto K, Kitagawa Y, Iwasaki Y, Yoshii F, Ikeda JE; ALS Consortium Investigators (2016) PLoS One 24;11: e0149509. doi: 10.1371/journal.pone.0149509. Nobili A, Latagliata EC, Viscomi MT, Cavallucci V, Cutuli D, Giacovazzo G, Krashia P, Rizzo FR, Marino R, Federici M, De Bartolo P, Aversa D, Dell’Acqua MC, Cordella A, Sancandi M, Keller F, Petrosini L, Puglisi-Allegra S, Mercuri NB, Coccurello R, Berretta N, D’Amelio M (2017) Dopamine neuronal loss contributes to memory and reward dysfunction in a model of Alzheimer’s disease. Nat Commun 8:14727. doi:10.1038/ncomms14727. Pizzolato G, Chierichetti F, Fabbri M, Cagnin A, Dam M, Ferlin G, Battistin L (1996) Reduced striatal dopamine receptors in Alzheimer’s disease: single photon emission tomography study with the D2 tracer [123I]-IBZM. Neurology 47:1065–1068. Baik SH, Cha MY, Hyun YM, Cho H, Hamza B, Kim DK, Han SH, Choi H, Kim KH, Moon M, Lee J, Kim M, Irimia D, Mook-Jung I (2014)Migration of neutrophils targeting amyloid plaques in Alzheimer’s disease mouse model. Neurobiol Aging 35:1286–1292. doi:10.1016/j.neurobiolaging.2014.01.003. Zenaro E, Pietronigro E, Della Bianca V, Piacentino G, Marongiu L, Budui S, Turano E, Rossi B, Angiari S, Dusi S, Montresor A, Carlucci T, Nanì S, Tosadori G, Calciano L, Catalucci D, Berton G, Bonetti B, Constantin G (2015) Neutrophils promote Alzheimer’s disease-like pathology and cognitive decline via LFA-1 integrin. Nat Med 21:880–886. doi:10.1038/nm.3913. Saresella M, Marventano I, Calabrese E, Piancone F, Rainone V, Gatti A, Alberoni M, Nemni R, Clerici M (2014) A complex proinflammatory role for peripheral monocytes in Alzheimer’s disease. J Alzheimers Dis 38:403–413. doi:10.3233/JAD-131160. Nottet HSLM, Gendelman HE (1995) Unravelling the neuroimmune mechanisms for the HIV-1-associated cognitive/motor complex. Immunol Today 16:441–448. Carrington M, Alter G (2012) Innate immune control of HIV. Cold Spring Harb Perspect Med. doi:10.1101/cshperspect.a007070. McDonald RH, Goldberg LI, McNay JL, Tuttle NP (1964) Effect of dopamine in man: augmentation of sodium excretion, glomerular filtration rate, and renal plasma flow. J Clin Invest 43:1116–1124. doi:10.1172/JCI104996. Beck GC, Brinkkoetter P, Hanusch C, Schulte J, van Ackern K, van der Woude FJ, Yard BA (2004) Clinical review: immunomodulatory effects of dopamine in general inflammation. Crit Care 8:485–491. doi:10.1186/cc2879.